Personalized 15.75" x 8" 2 Line Arch Address Plaque - - traditional arch shape address sign. Made in USA. Personalized with one or two lines of text and choice of color scheme. Optional lawn stakes can be purchased along with your plaque. All letters on this sign are capital letters. The first letter of each word is just a little larger than the other letters in the word. 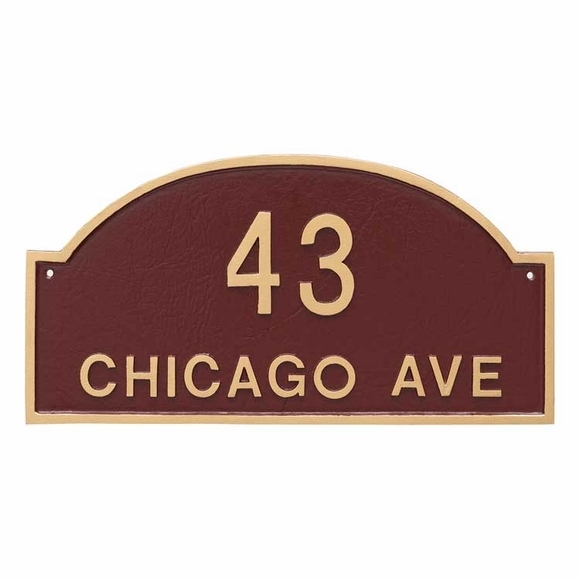 If ordered as a one-line sign (for example, house numbers only), then this plaque holds up to five 4" numbers. Please be sure to spell personalization accurately. Personalized arch shape address sign. Made in USA. Great product, exactly as shown online.